It’s a rare occasion when we go to our health food stores and indulge in one of the natural honey caramels on display. Those naturally sweet candies are a favorite treat in flavors like original honey, cinnamon and chocolate… but for around 40 cents per candy (and barely the size of a large grape) they are not the most economical buy. We wanted to have a homemade version of these caramels that would be less expensive, easy to make and still have that great caramel-y taste. This recipe works splendidly to meet our desired criteria. For an extra decadent treat, organic heavy cream was used to make the creamiest texture and flavor. These caramels are so dreamy, they create similar results to the popular Caramels candy but without all the sugar. And instead of sugar, honey is the only sweetener used! 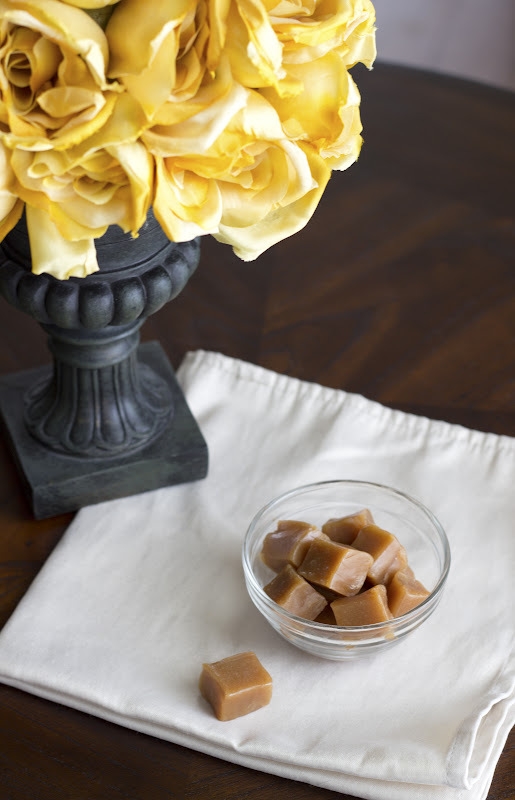 Caramel made from sweet, natural honey isn’t only delicious but a lot healthier than traditional candy! Chewy, rich and decadent, you’ll find honey caramels make wonderful gifts for friends or a tasty, special snack! We think they are yummy enough to replace any candy item in your Easter baskets, holiday candy platters or any party favor bag! Enjoy! Generously butter a 8X8 baking dish and set aside. Having your dish properly buttered is important for easy removal of the caramels. Combine honey and cream in a sauce pan and bring to a boil on high heat. Stir occasionally while it cooks. Continue cooking until the mixture reaches 240-245 degrees (just passed softball stage). The easiest way to verify the temperature is with a candy thermometer, though you can test it with other methods. Remove pan from the heat and immediately stir in vanilla and butter. Stir until butter is completely melted and combined. Place in the freezer to harden for 30 minutes. Cut into squares or scoop out with a spoon and enjoy! Keep leftovers in the fridge or freezer in an airtight container. If you are going to take these caramels with you traveling, be sure to keep them cool! They will melt in high humidity and hot temperatures and will become very sticky. We like using locally sourced raw honey when possible to ensure that the honey is %100 pure with no added sugars, but any honey will work great for this recipe. You can use a smaller dish than an 8 x 8 dish if you’d like extra thick caramels. Ours came out too soft as well, in spite of heating the honey mixture right up into the firm ball temperature. I assume it is because only honey was used. I used a very similar recipe recently with added sugar and that was the perfect firmness. This is tasty anyway, but not really wrapable at room temperature. I tried the honey caramel and wanted to use to make “Turtles” the popular nut, caramel, chocolate candy. But the caramel does not hold its shape. I used coconut oil instead of butter because I want the candy to be Vegan. Any suggestions. I wonder if I should use half sugar and half honey. Also would bringing the mix to a higher temp help? These were the best honey caramels I have tasted to date. What a fantastic, easy recipe. I will be saving this caramel recipe for the future and definitely making it again and again AND AGAIN! Oh and how fabulous it’s a sugar free recipe! Hello. These look AMAZING! I am just wondering though, how could I do flavor infused? Like chocolate or something? Thanks in advance! I’ve made candy for many years, and now we are trying to eat more naturally, so will be trying this. Thanks. We will be adding sesame seeds to ours. Wondering if those folks having difficulty are at a different sea level than you are… I have read that can impact candy texture. This is one of my favorite recipes on your whole site. What a healthy alternative to caramels. I love this sugar free honey recipe! Best healthy caramels yet. This was a great honey caramel recipe. Everyone loved it. Thanks! Just so you know… I printed the recipe using the “print recipe” button and it printed the entire page (37 pages in total!). Some of the words are cut off on some of the pages, but thankfully, not on the actual recipe page. There was no way to preview the print job, to choose which pages to print… (We happen to have a payment plan for our ink and pay more if we use more than 300 pages in a month, so this is a big deal to us. Our printer is in another room so I had no clue all these pages were printing, in case you were wondering why I didn’t stop it!) By the way, your site seems lovely and I really appreciate the recipe. We’re very eager to try it. I’m sure the comments section we printed will be helpful and worth a read, so that makes the situation better:-) God bless! Elaine, I’m so sorry! I can’t believe this post would produce 37 pages! SO sorry about that! I will look into this! Thank you for letting me know! And I really hope you enjoy these honey caramels! These healthy caramels are sooo delicious! I can’t believe these are made without sugar. Thank you!! One cup of honey is equal to 70 teaspoons of sugar. Your body doesn’t care where the sugar comes from. I’m baffled at the “sugar-free” label stamped onto this recipe. My grandmother has diabetes, and there is no way she could eat these. Well, because they are sugar-free. There is no processed white sugar in them. While I’m sure all agree that raw honey and maple syrup or other natural sweeteners are still sweets and should be consumed in moderation, honey is definetly a better choice than plain white sugar. Your body doesn’t process them exactly the same. I tried your recipe and after reading the comments did a few changes to hopefully alleviate ‘stickeyness’. It seemed to work pretty well but here on the northern prairies is not horribly humid outside. I greased the pan and then sprinkled chopped salted peanuts on bottom. I took the syrup to 270°F on a instant read thermometer and poured into dish. when setting but still soft I also sprinkled peanut layer on top. I put outside in freezing weather till fairly firm but still cutable. I cut portions and also dipped sides in the chopped nuts, squeezing in hnd so they were well incorporated. then wrapped in wax paper pieces. turned out pretty well. The salted peanut coating is a nice counterpoint to the ‘sweet’. Except for the peanuts the honey is my wildflower honey and cream was heavy grass fed organic from my neighbors that still milk. Peter, your additions sound fantastic!! Thank you for posting your comment and sharing the recommendations. I love that you used local and organic products as well! Hope you enjoyed these! These have got to be the BEST honey caramels ever! I love the flavor and texture. THank you!!! I’m so excited to come across this recipe and get the chance to make it. However do you use salted or unsalted butter? Or does it even matter which one? Well I finally got the chance to make these and they are absolutely delicious. Thank you so very much for this healthier recipe. The few friends who have tried these are raving about the taste and texture. They are so perfect. WOW!!!!!!! Who knew caramels could be made from honey and taste so good. Thank you for sharing!! I made two batches of these honey caramels and measure everything accurately. However they will not hold their shape. After I take them out the of freezer and cut them into nice squares, they just go flat like a puddle when they warm up. What am I doing wrong? Do I need to cook them longer to boil off more of the water? If so, for how long. They taste great. Thanks for your help. These honey caramels are PERFECT!! 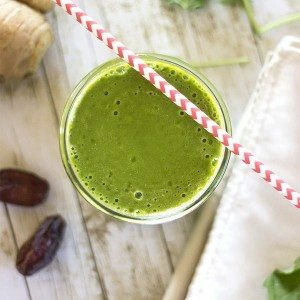 I’ve been trying different (sugar free) recipes, and this is by far the BEST, and EASIEST!!! I sprinkled a little sea salt on mine afterward, just to add a little twist. Honey caramel PERFECTION!! Thank you!! The recipe looks great, but what temp is the soft ball stage? I loved these! Great recipe. Thank you, Jane! So glad you loved them! Thanks for stopping by, Eden! We hope you enjoy the caramels! Thank you, Rachel! You could buy oil or extracts to add (we’ve tried cinnamon extract before) or you could use a stevia flavored extract. The stevia would make it a lot sweeter, which may be good depending on the flavor added. We have only tried the cinnamon though, so we couldn’t give extract/oil amount recommendations. Whatever you try, we hope you enjoy them! OMG these were incredible!! I couldn’t believe you could make caramels out of HONEY! I am a believer now and will only be making this recipe from now on. Thanks sooo much! Thanks, Yasmine! Isn’t honey amazing? So glad you loved this recipe! Hi. I was just wondering at what temperature should I be bringing the mixture to a boil? Low, medium, hi ? Thanks so much for the help. On high heat. That way you won’t be waiting forever at the stove. :) Thanks for asking, we will update the recipe so it’s more clear. Thanks for the response. I made the caramels by the way. I did something wrong :0/. It didn’t come out like caramel, rather like a soft, grainy, crumbly texture. It taste yummy, but jut not like caramel. Have you ever heard of this happening? Do you have any idea what might have went wrong? I accidently let the temp get to about 263. Could that have made it turn out that way? Well, I’m gonna try again cause they look sooooo yummy and I know my kids would love ’em. Thanks. Oh no! I’m sorry! The temperature would definitely affect the texture of the candy. Your thermometer could also be off? You could try checking your thermometer, and also bringing the honey to boil on med-high heat so you can watch the honey carefully. I hope it works out for you next time! Boy, what a great recipe!!! 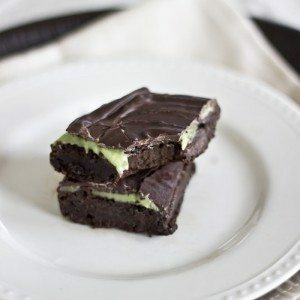 I have made these a few times and love love love the taste and texture. Thanks for this gem, girls!! You’ve made my family very happy! Great!! Thank you for sharing – your feedback is a great help! I made these a little awhile and wanted to comment. For being made with only honey, they were fabulous. For other readers, if you don’t like honey, don’t make them. They are honey caramels so don’t expect something like typical candies with corn syrup and artificial sugars. But if you want a healthy caramel recipe that is so delicious with a very slight honey flavor, make these!! They are delicious and I like the taste.. Great recipe! Not at the moment, but many readers have had luck using full fat coconut milk in place of the cream. We have not yet made these butter free. We have had requests for a vegan, or at least dairy free version, so we will try to come up with something soon! I’m going to try with soy creamer and vegan butter because I am allergic to dairy *crosses fingers*. We’ll see! Yes, maple syrup would work great! I often will use half honey and half maple syrup and it’s a fantastic flavor! I experienced the same problem that Eli did; after being in the freezer for an hour, the caramels were still liquidy. Can I salvage them by cooking them further on the stove? I am so sorry!! I know that is really frustrating. I am not sure what the problem was exactly for you. You could try reheating it and bring it back up to 245 degrees. Wash out your pan so it’s fresh and add a tiny bit of water to the pan (maybe 1 tablespoon). Pour the mixture back in and bring back to a boil and stir constantly. You don’t want the butter and vanilla to burn so keep stirring until it reaches 245. If it doesn’t work use it as an ice cream or pie topping! I’m sorry again for the hassle and hope you enjoy it! These turned out fantastic! My kids even liked them (which was a little surprising to me since they don’t love caramels). Merry Christmas! That is too funny! :) It’s good to meet more Annies and Chelseas! Welcome, I am glad you found us! Found you through PQ Monthly. I can’t wait to make these! They are gorgeous. I have made these about 10 times now and love them!! I find the more rapid boil and longer I cook it, the chewier the Carmel! It tastes amazing with meadow foam honey, marshmallow like! OH so glad you love them!! Thanks for the tip! Sounds yummy. These look fantastic! I am looking for a healthier alternative for making caramel apples, do you think these would work? :) If not I am going to make them anyway! I LOVE caramels but the store bought ones are loaded with crap! I made these today and they are LOVELY! These were fantastic! Thank you for posting! I am ecstatic about this recipe!! Thanks for sharing!! I couldn’t believe how delicious these are! Honey caramels? I was skeptical but so glad I tried these out. They were incredibly soft and caramely and just fabulous! Thank you! Can this recipe be modified to make a caramel sauce? Hi Joy, sorry for the late response! Yes, it can. We are actually working on another recipe specifically for that, but for now, you can just cook the mixture for less time, a little less than soft ball stage. This is typically around 210-220 degrees F. When the caramels have reached this stage, remove from the heat, allow to cool at room temperature and store in the fridge. It should be nice and thick, but still able to pour. Good luck! Hurray for caramels without corn syrup! Thank you! I LOVE the simplicity and the naturalness of this recipe. I’ve made it three times already. However I’m having trouble getting the caramels firm enough to be wrapped and stored at room temperature. My first batch I brought to 235 and it was runny enough to be sauce for ice cream, even when refrigerated. The second I brought to 250 and it was firm enough to slice and wrap, but the caramels stuck to the wrappers pretty badly. The last batch I brought to 263 and they cut and wrap easily, but are a complete MESS to unwrap and eat at room temperature. What am I doing wrong? Do I need to go even higher to make a firm, chewy caramel that doesn’t require you to wash your hands after eating? I just don’t want to go too high and make lollipops! It sounds like everything was done completely right for the second and third batches, it just sounds like the caramels heated up too quickly or it was the paper that was used to wrap them. Did you use a wax paper? The humidity could have played a large part in making them too sticky. 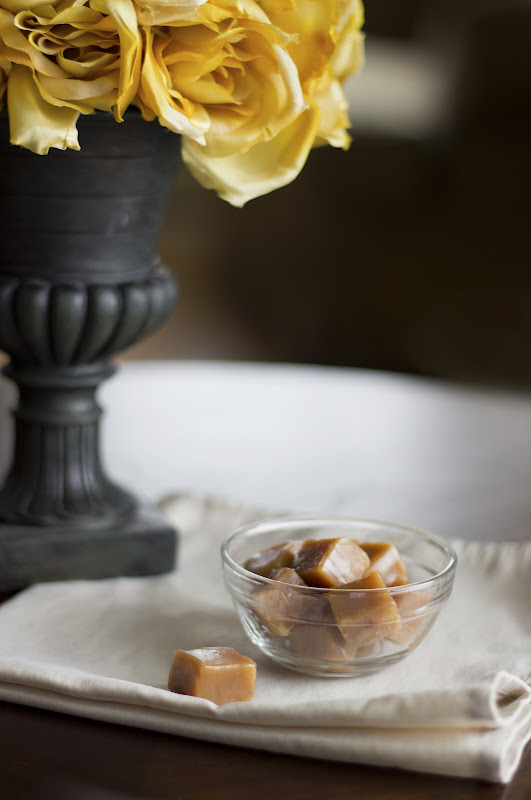 When the air is super warm and moist, these caramels may not hold up well for a long time at room temperature. You could try freezing the caramels after wrapping them and then eat them as they are thawing. Or maybe these caramels aren’t best individually wrapped for every situation/environment and we can update that for the recipe. I think you are doing everything right though. I’m sorry they gave you trouble, but I hope they were still delicious! :) Let us know if we can help any further. Thanks for your feedback! These were fabulous!! Thank you for sharing. So glad you mentioned using coconut milk. I was going to give this recipe a try with coconut milk and substitute coconut oil for the 2 T butter. What did you replace the butter with? Wow! I just made these and they are awesome! If anyone needs to know, I used the canned coconut milk and they came out just fine! mine seem to be really soft and hard to cut. I let it get to the soft ball stage. My kids love them so I am going to do the spoon method for christmas and serve them with coffee. 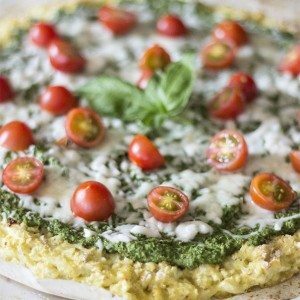 Great recipe that is corn free. have you ever tried to make these with other kinds of milks? i was gifted with a couple of quarts of goat milk, and think this would be lovely. 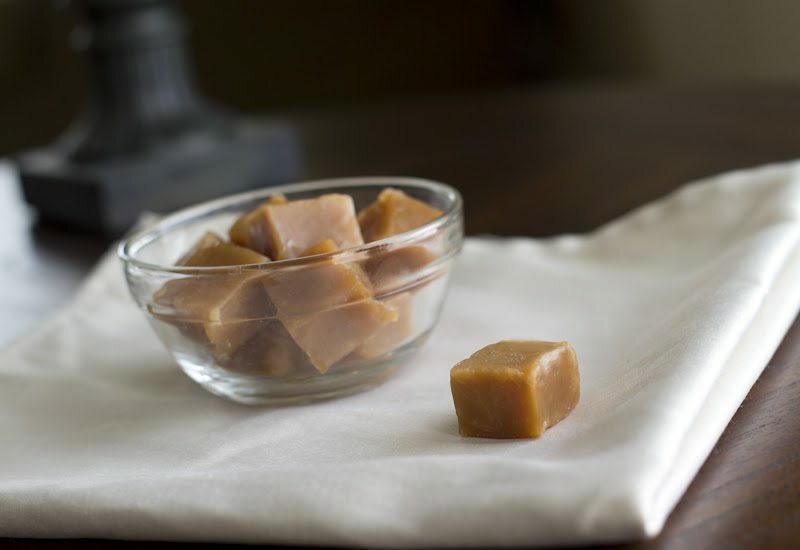 We have not tried this particular recipe with another kind of milk but we have made caramels with coconut milk before and they turned out great. I would love to know how the goat milk turns out for you if you try it! I agree- it sounds lovely! Did you use coconut milk or coconut cream in place of the heavy cream? We’re dairy free and have both on hand. Just want to know what is successful before experimenting. Thanks! Please use coconut cream! Milk will be too watery and won’t yield thick and chewy caramels. Hope you enjoy these! Melanie, that honey looks great! We always prefer raw honey, though any kind will work. Other readers have had success with using raw local honey, so I hope it works well for you too! Thanks! Thank you for this post! I make candy every year for Christmas and this sounds like a recipe to replace my family recipe which has lots of butter and refined sugars. Thank you for the comment! We agree! :) Good for you and your family for making such great health changes! Hope you guys enjoy the caramels and please let us know how you like them! That’s how we eat! as natural as possible, and at little sweet as possible, but with holidays comings my two kiddos are so sad when the other kids start passing around the treats. I am really looking to try this recipe as well as a homemade marshmallow for this fall. This page is beautiful! And so is that candy! Just wondering, does it take a lot of practice to get the desired turn out? Holidays can be the worst for that! I hope some of our recipes can omit that aspect of the holidays and your family can enjoy some healthy sweets! These caramels are not difficult, but I would HIGHLY recommend using a candy thermometer. If you’re familiar with candy making, you can gauge by the smell and appearance, but since honey is a little different that traditional sugar (and what most people are familiar with) the candy thermometer will ensure a successful turn out. Thanks for the comment! Thanks for the comment, Gemma. We are not against all sugars, just the super refined ones like refined white sugar, brown sugar, high fructose corn syrup, etc. We omitted sugars when we were following the candida diet, but since then, have stopped restricting ourselves of all sugars. We agree with you! Who wants to resist all sweet treats? On occasion, these are a healthier way to indulge than most other caramels. Thanks! I’m so happy you liked them! :) Thanks for letting us know! Any idea how long they will keep? Hi Judy! I’m not sure how long they would keep at room temperature, as these are gone at my house within a few days. :) Honey is an awesome natural preserver though, so I would say these could last a few days at room temperature and 2 weeks in the fridge. I’ve kept them in the freezer before for about a week and they were still good. Thank you! I made these tonight using raw local honey and they are fantastic! I may have to invest in some Fleur de sel to sprinkle on top. 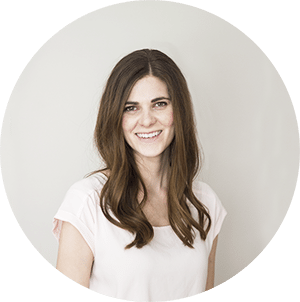 I really enjoy your blog – thanks again! I’m so glad you liked it! Thank you for letting us know! I had no idea caramel was so easy to make. Got to make these. I didn’t realize how easy it was either! Hope you like it if you do! These look amazing! Can you please tell me what it means to reach a “soft ball stage?” I am a relative rookie in the kitchen but I would love to try these. Thanks! Soft ball stage refers to a candys reaction/consistency when placed in cold water. When it’s reached this stage it should form a ball in the water. You can find sites online to teach you how exactly to do that, but I prefer using a thermometer! Soft ball stage is reached at about 240 degrees , and some thermometers have “soft ball stage” marked so there is no confusion when your candy has reached the temp you want. That’s the easiest way to do it and thermometers are really inexpensive! Good luck if you try them! Thanks Rebecca! Your honey caramels look so appetizing & tasty too! :) Yum Yum! I can’t believe you made these at home – they look store bought! Wow…so dreamy :). What perfect little caramel squares! They’re easily one of my favorite candies, and so easy to make at home. They really are easy! We had no idea until we tried it! I will definitely be trying these! 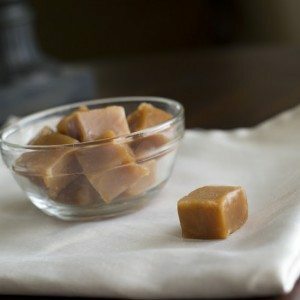 I love caramels and think it would be awesome to try it out with honey.